A solitary, massive, moderately slow growing, monoecious palm. Common in cultivation, scarce in the wild. It has a smooth, dark-grey trunk, 24.5 m. (80 ft.) tall, 183 cm. (72 inch) diameter with diamond-shaped leaf scars, and large segmented, pinnate (feather) leaves, 3.7 m. (12 ft.) long, 1.2 m. (4 ft.) wide, dull green above and, greyish green beneath. Not recommended for hot, humid climates, it grows slow, is never as large or beautiful, and tends to die out because of year-round high heat and humidity. It much prefers cooler climates. Jubaea chilensis can tolerate freezing temperatures to about -15°C (5°F). It naturally occurs in open, sun exposed, montane or lowland hilly locations, and should be planted to maximise sunshine exposure. Under extreme freezing conditions we recommend you keep this palm as dry as possible, which will usually mean constructing a glass or plastic roof over the plant to keep rain off. 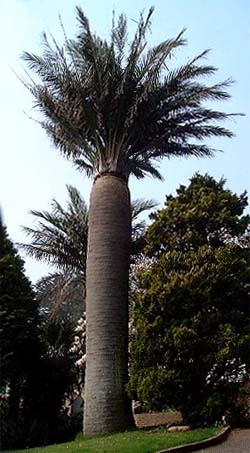 Any cover placed over this palm during times of rain or during cold nights must be removed or vented during hours of sunshine or the plant could be severely heat exhausted. Native to Chile, growing naturally on sides of ravines and ridges in dry scrubby woodland up to 1,400 metres (4,600 ft) above sea level in its natural habitat. The tree does not flower until it is roughly 50 years old. At this time the trunk starts to narrow by half its original girth to form a wine-bottle shape to the trunk. 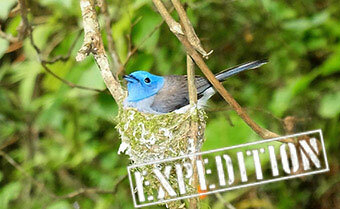 The tree in the photo was taken in Torquay England and is now just at the age to start reproduction. Formerly more common in Chile between 32° and 35°S but now confined to a few remnant populations, principally La Campana National Park and near Cocalán.